Granite Countertops of San Antonio and South Texas kitchen and bath countertops and cabinets. - Your countertop is made from full granite slabs. 2) Disconnect stove top and remove the sink. 3) Install new granite countertop, back splash and sink. 4) Your new granite countertops are polished and sealed. .
Plus, if your needs include custom cabinets for your new kitchen counters, we also design custom cabinetry up to 70% less than big box stores! Granite Countertops and Custom Cabinets is our families only business, and we have served the San Antonio and South Texas area for over 10 years. Providing expert design consultation, fabrication and installation of custom granite countertops by a team of skilled and experienced craftsmen. Our expert visits your home to review your needs, you are then invited to meet with him at the Granite Yard to pick out the perfect granite for your project. 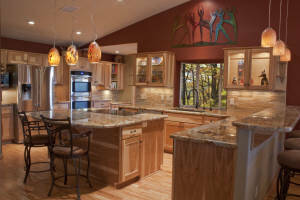 We measure and custom fabricate your granite countertops to fit your specific needs. We deliver the finest granite countertops, cabinets and custom kitchens / baths at the lowest overall price in the San Antonio & South Texas Area. more information about "The Process"